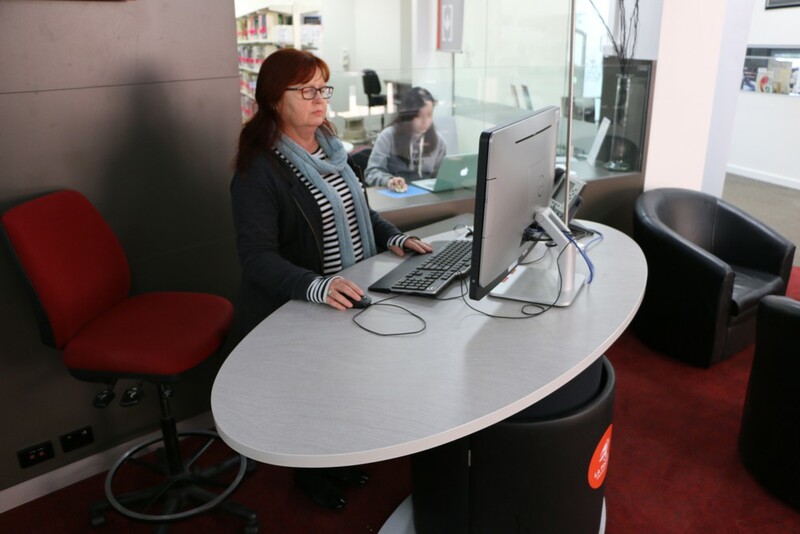 La Trobe University’s Bendigo Campus Library, sought to implement highly accessible and adaptable student help points in the central entrance and hub of the library. The new help points, (positioned in an area adjacent to an existing counter) were to provide a platform supporting staff/student interaction. 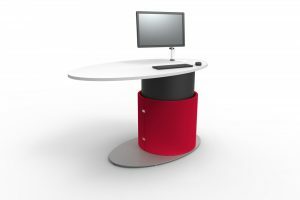 The University specified two of Instinct Furniture’s YAKETY YAK Oval 1600 Counters, to be positioned together but with plenty of circulation space between. Two YAKETY YAK counters positioned side by side. Streamlined and modern, YAKETY YAK is all about connecting with customers; and with the benefit of touch-button height ajustability, staff can work at the optimum, safe height. 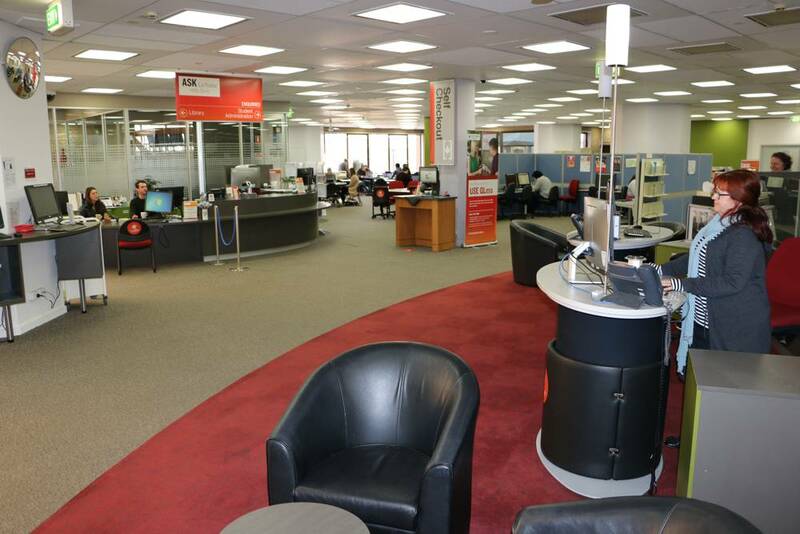 The exchange between students and staff can take place comfortably, either seated or standing. Staff can work comfortably either seated or standing. YAKETY YAK’s central barrel positions over floor services to neatly asorb all cabling. And, with a retractable castor option, staff can move YAKETY YAK as the need may arise. 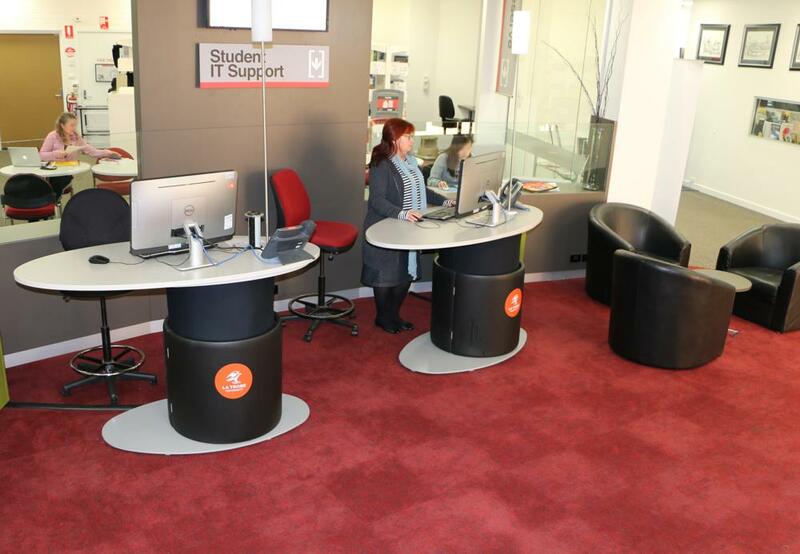 For Bendigo, the help points were fitted with stylish light stands making them even more identifiable. These were later removed (made possible by the flexibility in design) as counters were well positioned and already highly visible, freeing up extra desktop space. The library’s new, highly visible and interactive help points have become a place to be welcomed, informed and inspired. New counters (right) were positioned adjacent to an existing counter (left).